The black-hulled Morrissey first set sail for the Grand Banks on March 14, 1894, just six weeks after her launching. William Edward Morrissey was the ship's skipper (Effie Maude Morrissey was William's daughter) and on that first trip he kept the Morrissey out salt-banking for four months. When the schooner returned to Gloucester in July, her hold held 250,000 pounds of salted cod. This was the biggest catch that any schooner brought in that month and it fetched a decent price: $4.00 per quintal (100 pounds) for large fish and $3.50 for small. The Morrissey worked most often as a dory trawler. 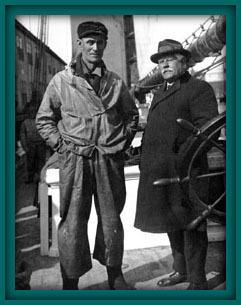 The crew of twenty fishermen would pair off in each of the ship's ten dories to trawl for cod, haddock or halibut from lines paid out of tubs. 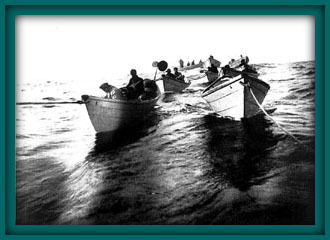 When the dory was full of fish the men would row or sail back to the schooner, tended in the meantime only by captain and cook. On occasion a storm would blow up sending the dories away from the ship, yet the records show that in all her years of fishing the Morrissey lost only one man. Captain William Edward Morrissey was born in 1845 in Lower East Pubnico, Nova Scotia and died 27 January 1913. He married Caroline Larkin in September 1867 in Woods Harbour, Nova Scotia. Caroline was born 15 June 1851. The children of William and Caroline were Ida Serena Morrissey (20 July 1868 - ? ), Athelston Y. Morrissey (1871 - 29 March 1899) who died at sea, Capt. Clayton E. Morrissey (12 September 1873 - 1 July 1936), Effie Maude Morrissey (8 November 1877 - ?) and Capt. William F. Morrissey (1879 - ?). Clayton's extended family tree is shown below. November 8: 320,000 lbs cod / 2,000 lbs halibut. April 11: The Schooner Effie Morrissey will go to the Banks under command of Captain Clayton Morrissey. Her regular skipper, Captain William Morrissey being too ill to continue. Clayton is William’s 19 year old son. Herring fishing in Placentia Bay sailed on to New York. The Morrissey went shore in Smith’s Cove during a November Nor'easter', was refloated and damage was quickly repaired. The ship was on to Newfoundland again for herring under Capt. John MacInnis and later handline dory fishing. Owners: John F. Wonson 7/24, Roger W. Wonson 7/24, William E. Morrissey 10/24. Haddock fishing and salt cod fishing for the next few years. Very successful years for the schooner and her crews, paying good shares. Edward Rapp, 22, native of Shelburne, NS, washed overboard on the Grand Banks on November 13, 1899 and was lost. Here is part of the Morrissey family tree. 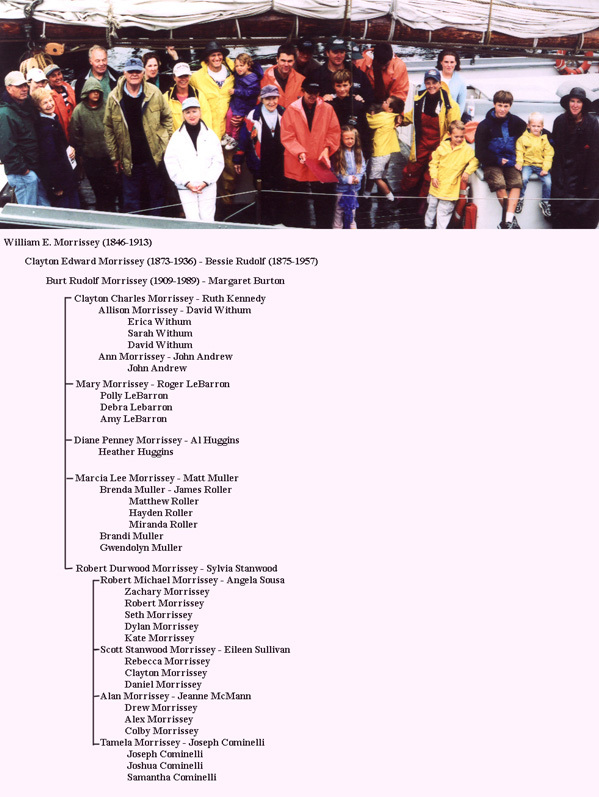 The Morrissey family came for a sail on the ship in September 2002.